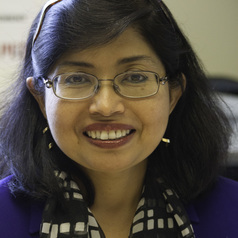 A business-to-business marketing expert, Sharmila C. Chatterjee examines issues in the domains of channels of distribution, sales force management and relationship marketing using survey research coupled with econometric methods for analysis. In the area of sales force management, she carried out some of the first studies in the critical area of sales-marketing interface, specifically, sales lead management. She is interested in effective management of the sales/marketing interface with a view towards appropriate allocation of resources between customer acquisition and retention activities. Lately, Chatterjee has become interested in the diffusion of technological innovations among users at client organizations under the rubric of value based management. In B2C, Chatterjee has done research in the areas of brand trust, financial literacy and multicultural marketing. Chatterjee has published in Behaviormetrika, Industrial Marketing Management, Journal of the Academy of Marketing Science, Journal of Marketing, Journal of Retailing, Marketing Letters, Marketing Management Journal, and The Marketing Report, among others. She is an award winning case writer with several of her cases placing first in the case writing competitions sponsored by the educational wing of Direct Marketing Association. Chatterjee is the Academic Head for the MBA Track in Enterprise Management (EM) launched at MIT Sloan in Fall 2012 and is a Senior Lecturer in Marketing. Chatterjee teaches the graduate course in B2B Marketing and is deeply engaged in Action Learning with being a faculty mentor for G-Lab, China/India Lab and an instructor for the Enterprise Management (EM) Lab. Chatterjee graduated from the Birla Institute of Technology and Science (BITS), Pilani and worked briefly in Faridabad, India before earning her Ph.D. in Marketing from the Wharton School, University of Pennsylvania.